Framing theory deals with the manner in which issues, events, and actors are portrayed in a communicative text. Framing studies often focus on mass media frames given the assumption that the media influences public opinion. Robert Entman views framing as the result of selection and emphasis. To frame, according to Entman, is “to select some aspects of a perceived reality and make them more salient in a communicating text, in such a way as to promote a particular problem definition, causal interpretation, moral evaluation and/or treatment recommendation for the item described”. Of course framing is not limited to the media. Governments often use framing techniques in order to promote a certain understanding of events. As Entman demonstrates, following the 9/11 attacks President Bush addressed the American people stating that the attacks on the US were an act of war and that the American people must unite in the struggle of good versus evil. In his remarks, Bush defined a problem, offered a causal interpretation and suggested a remedy. The media’s adoption or rejection of government framing in the realm of foreign policy has traditionally been viewed as a matter of great importance given that the majority of the population learns about foreign policy issues from the media. Therefore, various scholars have proposed models that illustrate the interaction between government, media and the general public with regard to foreign policy coverage. One such model is Entman’s cascading activation model from 2004 illustrated in the image below. In this model, a frame extends from the White House to the public while passing through other elites and the press. The model illustrates two important factors. The first is hierarchy demonstrating the administration’s ability to push a certain frame down the cascade. The second is a feedback cycle in which the media offers the administration insight into public opinion which in turn may influence the administration’s frame. However, in the age of digital diplomacy such traditional models may no longer be sufficient. By following the twitter channels and Facebook profiles of MFAs, the public is exposed directly to government framing. Thus, the mass media may no longer retain their unique role as filters of government framing. As digital diplomacy continues to evolve, it is possible that growing numbers of citizens will be able to interact directly with their respective governments. This necessitates the creation of a new model that takes into account the new relationship between governments, the media and the public. Such a model should include immediate feedback from the public to the administration as MFA followers comment directly on tweets and posts published by the government. 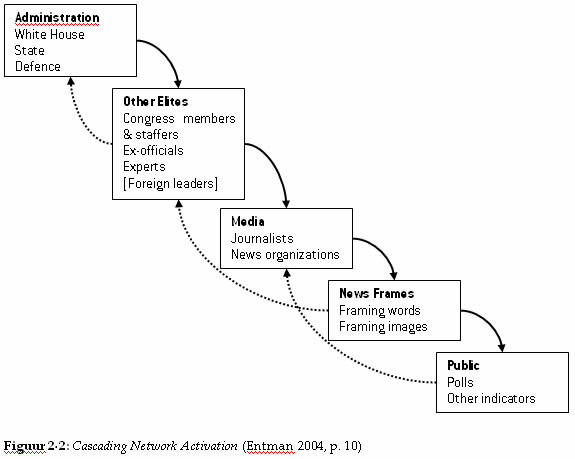 Secondly, the hierarchy of Entman’s model may have altered as both journalists and MFA followers are exposed to government framing at the same time and in the same form (i.e., both view the same tweets). 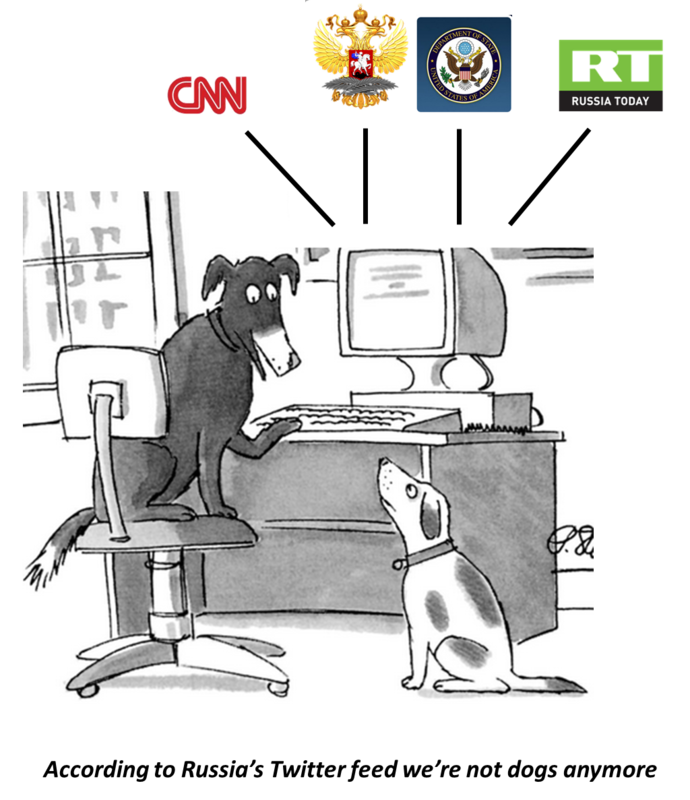 However, digital diplomacy presents additional challenges to communication models. This is due to the fact that social media users may follow several MFAs thus exposing themselves to a multitude of frames all dealing with the same issue. Such is the case with social media users who are following both the State Department and Russia’s MFA in an attempt to gain information regarding the conflict in Easter Ukraine. World Leaders- Many world leaders have recently migrated to social media. These include, among other, high ranking diplomats which attract a large online following. US Secretary of State John Kerry has more than 400,000 followers on twitter while former Swedish foreign minister Carl Bildt had more than 300,000 followers. Such figures also routinely use framing techniques. In the following tweet, for example, John Kerry uses frames as he identifies a problem (the crisis in Ukraine), offers a causal interpretation (Russian escalation) and offers two remedies (Russian de-escalation or economic sanctions against Russia). Foreign Ministries- Americans following the State Department’s social media channels are exposed directly to US government foreign policy framing. Yet Americans interested in foreign policy may also follow other countries’ social media accounts. Thus, foreign ministries may be competing over the attention of a globally engaged audience. As each ministry offers its own narrative, digital diplomacy followers may find themselves confronted with conflicting information and conflicting realities. Local Embassies: Local embassies are also able to attract large numbers of followers. The US embassy in Pakistan, for instance, is followed by some 50,000 followers while Israel’s embassy to the US has more than 80,000 followers. Embassies can tailor foreign policy messages to the unique characteristics of the local populations (e.g., history, values, past conflicts) thereby increasing the influence of such messages. Thus, embassies may be able to challenge the framing of events presented to the citizens of a given country by their respective government. Such is the case with the tweet below in which Israel’s embassy to the US offers a different illustration of Iran then the one currently promoted by US officials. The media- Of course social media, and the advent of digital diplomacy, have not reduced the importance of the media. Studies show that the majority of the adult population still learns about foreign policy through news organizations. Yet the social media eco-system has brought with it two major changes. The first is one’s ability to receive information from numerous news organizations at little or no price. As opposed to the days when people had to subscribe to a newspaper, people can nowadays get their news from multiple sources at no cost through their Facebook feed (e.g., CNN, BBC, New York Times, Al-Jazeera). As each media outlet has its own agenda, each may illustrate a different reality and offer different frames. Moreover, people may now follow news organizations from foreign countries. Thus, A Russian citizen may follow both Russia Today and the Wall Street Journal. As the media tend to “rally around the flag” and adopt the government’s foreign policy framing in times of crisis, such a Russian will be faced yet again with contradicting realities. New Gatekeepers- While the media was traditionally viewed as an information gatekeeper, social media has brought with it new gatekeepers who might be just as influential as mass media outlets. These include popular bloggers or social media leaders that attract a mass audience. Hamdy and Gomma explored how the same event, the Egyptian uprising of 2011, was framed by state-run media, independent media and private SNS users finding that each of these three offered a different interpretation of reality. Their study demonstrates that private SNS users may be just as influential as the traditional media and have thus risen to the rank of gatekeepers. In summary, people now live in an information rich environment. Yet in the realm of foreign policy, people may be exposed to an entire array of different, and even contradicting, realities produced by different actors and their framing of events. We may therefore be in need of a new communication models that illustrates the interaction between media, people and government in the realm of foreign policy. We also need to better understand how people negotiate between such conflicting realities in order to make sense of the world around them. Posted in Uncategorized and tagged communication, Digital Diplomacy, Israel, John Kerry, mass media, Russia, Social media, US. Bookmark the permalink. Do MFAs Operate as Social Networks?